Ханс-Петер Мартин и Джордж Хэндэсайд в 1908 году решили объединить усилия и создали одну из первых в Великобритании компаний для проектирования и постройки самолетов. Компания "Martin and Handasyde Ltd" позже ДальшеMore>>> была переименована в "Martinsyde Ltd". Первым ее самолетом стал моноплан Martin-Handasyde No.1, оснащенный автомобильным мотором Humber и так, впрочем, и не взлетевший. В целом схожий с ним самолет No.2, построенный в 1909 году, в воздух уже поднялся - это произошло в Бруклендсе, графство Сюррей. Успех окрылил разработчиков, и затем были один за другим построены монопланы No.3, No.4B Dragonfly и 1912 Military Monoplane - все они создавались на базе элегантного французского моноплана Antoinette. Early type: An early Martinsyde monoplane (50 h.p. Antoinette). Note the wind shield in front of the control wheel. REFERENCE was made on the previous page to the 1911 type Martin Handasyde monoplane. A little more of this machine is shown here. In this view the skid under the "nose," terminating in a "spoon" shoe, can be clearly seen, as well as the kingpost system of wing bracing employed. 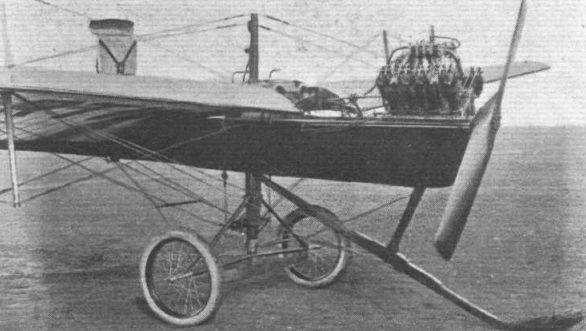 The earliest Martin Handasyde monoplanes, produced at Brooklands were strongly influenced in their design by the French Antoinette monoplanes, and the engine fitted in the machine illustrated, was in fact, an Antoinette water-cooled engine. Actually it would be more correct to say that it was a steam-cooled engine, for the water in the jackets was permitted to boil, and the steam was condensed in large condensers mounted along the flat sides of the triangular-section fuselage. In view of the modern tendency to revert to evaporative cooling, it is interesting to recall that this was employed fairly successfully 19 years ago. The photograph shows the cockpit of an early Martin Handasyde monoplane. It will be noted that the cockpit is very shallow, the triangular-section fuselage being largely responsible for the high position of the seat. Mounting the windscreen on the control column now seems an unusual procedure, but probably the idea was also to relieve a certain amount of tail heaviness.